"Love" token, awarded by mantissa. 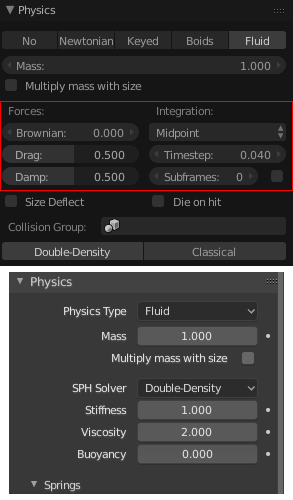 When changing the particle physics settings from Newtonian to Fluid the Forces UI elements disappear and Integration ones are missing. Also, the Fluid Interaction box is called Relations. 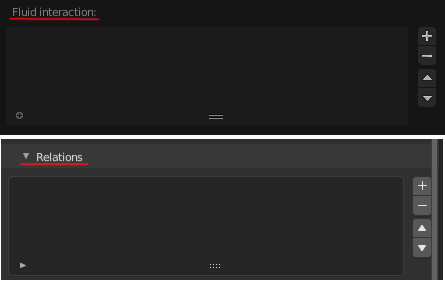 Maybe the wrong UI element is loaded here or has the name simply changed? This is probably my fault - I will make a patch to fix it. When I re-did the particle properties, particle fluids weren't working, so couldn't test with those settings. Campbell Barton (campbellbarton) added a commit: rB6be8c64e9ade: Fix T61187: Fluid Particle settings UI elements.